With the release of Tabular model / PowerPivot we have introduced DAX functions that work with a Parent Child dimension. In this blog post we will show you how to use these functions to set up a parent child relationships and using it in a hierarchy. First of all we need a table that has a parent child relationship. In this case I loaded the adventureworks database where the employee table has an EmployeeKey column and a ParentEmployeeKey column. The first thing we need to do is create a calculated column to determine the parent child path on the table. 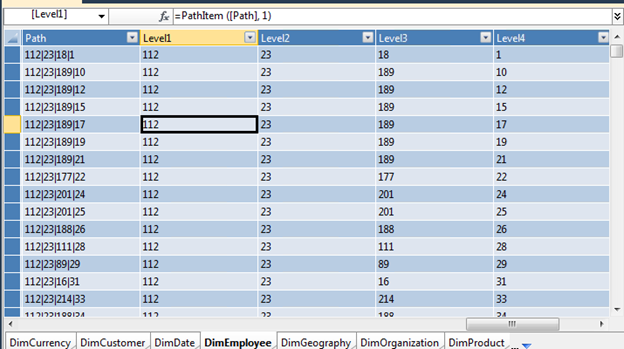 You need to use the DAX function PATH that will create a path of id’s from the current level until the top level. 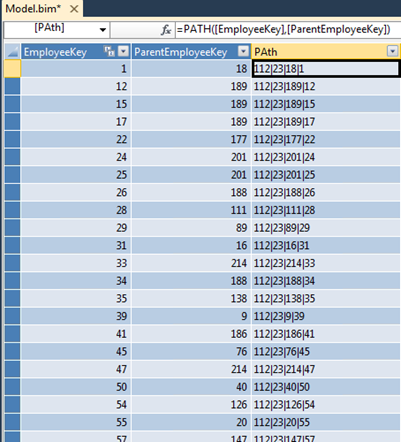 As you can see the column now contains the complete path of EmployeeKey’s from bottom to top stored as a single string value. In the selected column you can see that Employee with Key 1 reports to Employee with Key 18 reports to Employee with key 23 which reports to Employee with Key 112. A big benefit of this approach is that the complete parent child path is pre generated and stored inside the model and in memory. This will get the item from a specific Path column at a position and can return a string or a integer value depending on the type (string by default). This will get the item from a specific Path column at a position starting from the end and can return a string or a integer value depending on the type (string by default). This will return is will returns a TRUE of False if the Item exists in the specified Path. Used in Filter functions. So how can we use these functions in DAX? Let’s start by creating a flattened column structure. For each level in the parent child we want to create a column. Unfortunately because there is no way to create dynamic measures we have to manually create a calculated column for each level. The biggest benefit about this approach is that it is lightning fast. 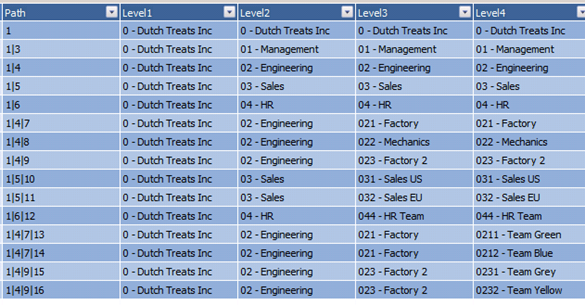 We use the Dax function PathItem for each calculated column to get the key of a specific level. 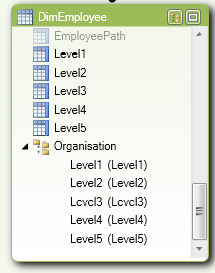 If you have a ragged hierarchy you might want to check if there is item at the current level, if there is nothing you can use PathLength to get the last item in the parent child and thus repeat the level. Otherwise use the values from the current level. Another example of a Parent child function could for example be to use the Pathcontains function in a DAX query to return all employees that are in the organization together with employee with key 3. There are some nice improvements in PowerP, really nice. I watched your below TechEd 2011 video for DAX . I wonder if Micosoft is plan to consider “Dynamic Parent-Child level” feature in new PowerPivot release. In above post, you have created Level 1, Level 2, Level 3, Level 4 and Level 5 “manually” uasing DAX. In my reporting requirement, I don’t know number of level in parent-child releationship (in some instance it could be upto 3-levels or 8-levels or… ) and it has to be dynamic. Are you considering this option for future release or is there any workaround for existing PowerPivot version? Thanks. Thank you for your post. We have many plans but it is too early to comment on them. If you want your feedback to be heard please file a suggestion at http://connect.microsoft.com/sqlserver . This will get visibility to the AS team and will be noted. i understand that it is possible using VBA coding in excel or Recursive queries in SQL server, but i am not good in any of them. Yes that should work. It works in my simple example. I feel like your parent child data is not really parent child but contains some holes. following your note i copy pasted the table (from the green environment) to a new excel sheet, the i created a linked table. now the path works. but still in the original file (in which the data is based on ODBC and there are links between files) i get the same error. @Rohit Acharya , if your hierarchy is dated, one solution is to created calculated columns where you concatenate the date and the hierarchy keys. 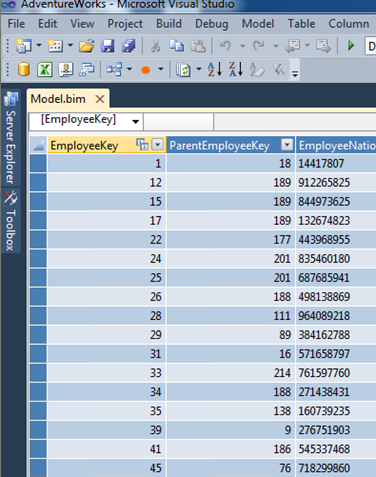 I.e., you create columns EmployeeKeyDated and ParentEmployeeKeyDated, defined as something like DateKey & “_” & EmployeeKey, likewise for the parent key column. Then you have two columns that can be used to calculate a path on, and the PATH function doesn’t need to know that there are multiple hierarchies, one for each date. Hope that helps. Sorry if i will do a silly question about PARENT-CHID Dimension in POWERPIVOT scenario. In Our company will buy as soon as possibile SQL SERVER 2012 but now ,i can do only with powerpivot last release. (I used MULTIDMENSIONAL but i am studying also powerpivot to understand if some multidimensional project i will convert in tabular mode). I have a dimension PARENT-CHILD to describe categories of PRODUCTS. I have a table in my DW DB that descibes all these levels and i can attach to my powerpivot DB…I used that to create a parent child dimension in a Multidimensional scenario. 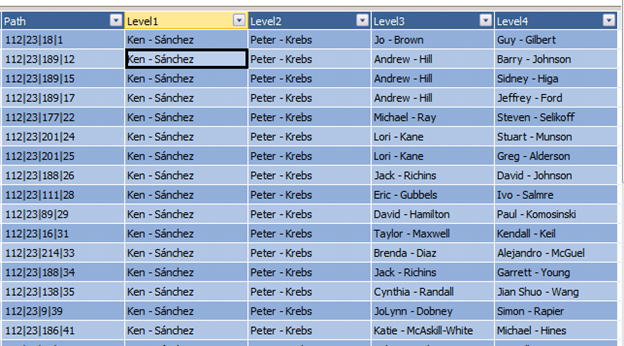 But the problem is how i can now represent this kind of dimension in a powerpivot…??? What works around i have to do ??? Will you have any examples …??? How to do this on SCD Type 2 employee table? I get error in Path function because for same user id there exist 2 records with different manager ID’s. Kasper this a great DAX function. I’m trying to use this but my source data has some issues. Specifically I have [ParentEmployeeKey] values that are unexpectedly missing from my [EmployeeKey] column. (effectively meaning an employee reports to a manager that does not exist). When I try to use PATH in this scenario I receive an error about missing keys. I tried to wrap the whole PATH function with ISERROR, but the calculated column still fails. How can overcome this problem without cleaning up my source data before I pull it in to PowerPivot? I like this article, But how can I acheive if one child have multiple parents. Please let me know..the suggestion. Thanks for the information. It works great. However, wouldn’t it be simpler to create a sql query, by using self joins to obtain the parent child information and then use power pivot to create the hierarchy? This eliminates the need for somewhat complex dax calculations. PATH(table[Id], table[parent_id]). PowerBI returns alert: The PATH function has found the following loop: ‘17349|17418|17349|17269’ in columns table[Id] and table[parent_id]. 1. There is a missing closing square bracket on Last Name in the last LOOKUPVALUE function. 2. The last two PATHITEM functions close the parenthesis too early. Hope that helps whoever is trying to implement this nice solution by Kasper.